He’s challenging incumbent Dianne Feinstein on foreign policy, immigration, and the national-surveillance state. 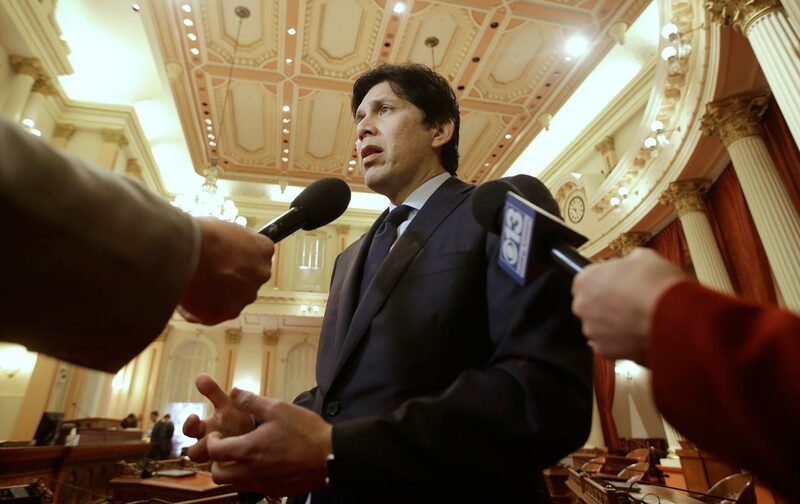 Kevin de León has served in the California State Legislature for 11 years, representing the Los Angeles area; since 2014, he has been Senate president pro tempore. Last November, de León announced that he would be challenging incumbent Democratic US Senator Dianne Feinstein in the open primary, scheduled for June 5. On February 1, Sasha Abramsky interviewed de León in Sacramento. Sasha Abramsky: Why are you running? Kevin de León: I think that we are long overdue for a debate on the issues, the values, and the priorities that we care about. It’s been more than a quarter of a century since we’ve had that debate. These are very historic times in our nation, very dangerous times in our state. And it’s time that we have a voice that’s reflective of the California of today. This is not the time for complacency or patience, but to do everything in our power to protect our communities, our economic prosperity, our progressive values, and our people. Our environment, climate change, the Dreamers, creating real economic opportunities so we can grow the middle class. SA: I’m sure that Senator Feinstein would say the same things. What sets you apart from her? KDL: What we have done dramatically in California is lead the entire nation. For example, we have created more jobs in clean energy in California than there are coal-mining jobs in all of America. In terms of the Dreamers, we have defended the Dreamers by investing $25 million to provide legal services, we have made California a sanctuary state. These are times that require real action, not being on the sidelines but on the front lines. SA: How would you debate these issues with Senator Feinstein? [Feinstein] has been an immigration hawk since the beginning of her tenure as a senator. KDL: I believe strongly that, for example, I wouldn’t have voted for the war—now we are 17 years straight in Afghanistan and this war has cost us over $1 trillion so far. These types of votes have real consequences on human life as well as our budget: money that we could have utilized best in education, in job creation through investments in our infrastructure, our roads, our highways, in clean energy, in investments in precision medicine to find the next cure for Parkinson’s or Alzheimer’s. On immigration, I’ve always believed one of our greatest strengths is our diversity and inclusivity. She has been an immigration hawk since the beginning of her tenure as a senator, voting for a border wall before Donald Trump, in 2006 [the Secure Fence Act]. On the issue of climate change and the environment, because climate change is an existential threat to our economy and to our way of life, it is not enough to be a yes vote. We need real action, as demonstrated here in California—my Senate Bill 350 [The Clean Energy and Pollution Reduction Act], SB 1275 [the Charge Ahead California Initiative], SB 535 [the Global Warming Solutions Act]. Now’s the time for real action. The leading voice in Washington on issues of climate should always be from California. That’s not been the case. If I went to Washington I would make sure we made it a national platform, export our California values to Washington, not the other way around. We need criminal-justice reform. I would never vote to allow 13-year-old boys to be prosecuted as adults. SA: You’ve distinguished yourself from the senator on surveillance and the national-security state. How do you differ from her here? I don’t support giving power to the US government to spy on US citizens without a warrant—unlike Senator Feinstein, who supported that amendment. KDL: While we need to provide leadership and stability to the world, we should do that through diplomacy. Senator Feinstein voted for the Iraq War, increasing surveillance. The nature of FISA… I don’t support giving power to the US government to spy on US citizens without a warrant—unlike Senator Feinstein, who supported that amendment. I don’t believe the federal government should be snooping into American citizens’ cell phones without a warrant issued by a federal judge. You cannot give the federal government extraordinary powers to eavesdrop without a warrant. It’s simply un-American. Foreign relations should involve human rights, workers’ rights, and environmental protection. The heaviest immigration to this country comes from Mexico, India, China, and the Philippines, yet our foreign relations don’t prioritize the factors of why, why folks come. We look at the Western Hemisphere, we have some of the biggest foreign-relations challenges before us, the issue of immigration, the issue of drug cartels, the importation of illicit drugs, the exportation from America to Mexico and Central America of high-powered assault weapons, long guns, handguns, ammunition. Being a Spanish speaker would allow me an opportunity to help create a much more conducive relationship with our neighbors within the Western Hemisphere to deal with issues that have a huge impact on both sides of the border. SA: How are you going run your campaign, pursue the issues, raise your profile, in a way that gives you a credible pathway to victory? KDL: Obviously, the reality is that I’m not a billionaire. I don’t have the power and name recognition. But I have to get my message out there, and I believe it will resonate with the voters. I will travel up and down the state of California, and take my message directly to the voters. It’s a grassroots campaign, as it should be. You can talk about slicing and dicing, what can you coalesce together; but I’m focusing not more on one community over another. Not Southern versus Northern California, or Central Coast versus Central Valley, it’s about a coherent vision for California. I won’t be able to match her money-wise. She’ll have all the money she needs, but it’s not always about the money. If I didn’t think I had a chance of winning, I wouldn’t be running. This isn’t about one individual; it’s about who we are as a state and the type of representation we want and need today. I have to run a nontraditional, almost insurgency-type campaign. It’s not about seniority in Congress; it’s about the human audacity of wanting to have your voice heard and represented in the nation’s capital. It’s great for democracy; it gives voters a choice. SA: Is there a risk it could split the California Democratic Party? KDL: It’s always a good thing to have a choice. SA: Over the last year California has positioned itself as the anti-Trump state, and you’ve positioned yourself as the anti-Trump politician. Can you run your campaign as the anti-Trump candidate? KDL: When I made the decision on November 9, the day after the presidential election in 2016, that we would lead the resistance, it was based on my values—and my role as leader of the Senate to do everything within my power to protect our economic prosperity, our progressive values, and our people. But it’s not only about resisting; it’s about being proactive, moving policies driven by values that improve the human condition for all Californians regardless of who you are, where you come from, which god you pray to, and who you love. And I think we have been quite successful in doing so, raising the minimum wage, the most far-reaching climate-change policy in the nation, equal pay for women doing equal work, the most far-reaching gun and ammunition laws in the country. The list goes on and on. It’s not just about resistance. It’s also about real laws that have improved the human condition for all Californians. There are three main issues: Our environment and climate change. Medicare for all. And immigration reform. SA: Senator Feinstein is 84 and will be in her early 90s by the time the next Senate term ends. How are you going to highlight that this is partly about which generation is in the ascendancy? KDL: It should never be about age. Age has nothing to do with the reason I’m running for the US Senate. This is about having a long overdue debate on values and the leaders who represent us in Washington. There are men and women in both houses, across generations, like Bernie Sanders, who don’t equivocate when it comes to standing up for the values of the people they represent. Senator Feinstein hasn’t had a primary challenge since 1994, and half the voters in California believe she shouldn’t run again. She doesn’t line up with what Californians believe are the most pressing issues of the day: climate change, Medicare for all, the minimum wage. SA: If you get to DC, what will your legislative priorities be? KDL: There are three main issues: our environment and climate change. Medicare for all. And immigration reform. Clearly, we need a pathway to legal permanent residency and eventually citizenship for the 11 million undocumented—hardworking families who reside in our nation; we need to increase the budget, because when you hear the story of 10, 12 years to legalize status, that’s a huge bottleneck. That’s a ridiculous number, when it takes so long to normalize the status of a loved one. You’d want to deal with DACA immediately by giving them a pathway to citizenship and finally stop using them as a political football. SA: You and Kamala Harris would be a powerful duo. How would that impact the 2020 elections? Does it give California a bigger role in the presidential process? KDL: California today has the fifth-largest economy in the world. It could be used as a model for many other states, to grow an economy, to create jobs, to move policies that clean up our air while at the same time providing for economic growth. Everyone deserves the right to breathe clean air, have access to health care, and have a decent, high-paying job. California is America before itself. Why not help move a clean-air, clean-water policy that provides for economic growth and puts people to work? It doesn’t matter to me if you’re a Republican or a Democrat, everyone deserves an opportunity to succeed, to send their kid to college. Poverty is poverty, whether you live in a red state or a blue state. Let’s build policies that have been verified to actually work, to help people, that help working families. SA: Let’s say you win, and you’re in DC for a long time. What would make you happiest as a legislative accomplishment? KDL: Given the opportunity to be a voice for California, creating jobs by moving policies that clean our air and deal with the existential threat of climate change. And immigration reform that will heal this nation and bring us together, as opposed to dividing and polarizing and tearing the fabric of who we are as a great nation.